Home > Blog > How to implement a QRM project? The QRM Institute Silver ® Course associates theoretical knowledge of the QRM principles and practical applications through exercises and operational simulations. 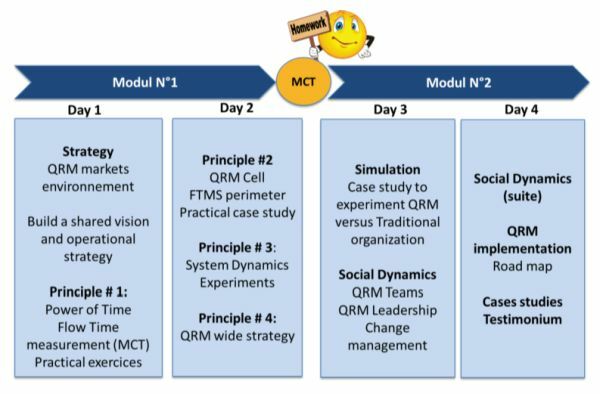 You want to transform a traditional cost-centric workshop or support services into an agile QRM cell organisation focusing on reducing lead times? The QRM Institute Silver ® Course can help you. This 4-day training course in English (i.e. two 2-day modules) is organised in partnership with Sirris. It will be held in Paris on 16 & 17th January and on 20th & 21st February 2019. After completing the course, you are capable of contributing towards the implementation of a QRM project. You are capable of conducting comprehensive analysis in accordance with the methodological QRM principles and of launching a project under the guidance of an internal QRM Institute Gold graduate or external consultant. As founding member of the QRM Institute, Sirris offers its members a 20% reduction for this top-level training course.